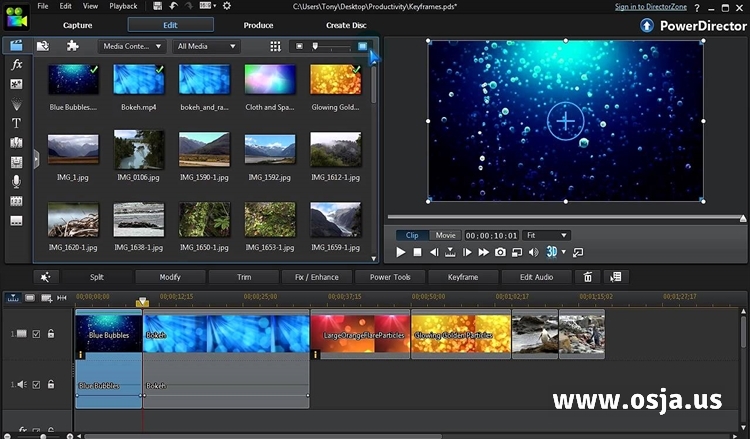 CyberLink PowerDirector has been one of the top consumer video editors for a few years now, and you don’t have to use it for long to understand why. The core editor gets the program off to a good start. Import your source files into the Media Room, organize them on the 100 track timeline, and apply hundreds of effects and transitions by dragging and dropping: it’s all very easy. PowerDirector also allows a great deal of fine control over just about everything you’re doing. If you want to add a caption to a clip, say, you could just enter the text. But you can also configure a host of font and text settings, as well as setting up shadows, borders, reflections, adding a 3D effect, even applying one of 70 motion effects (scrolls, fades, wipes and more). And once you’ve finished, a wide range of export options mean you’re able to save your project as a video file, burn it to DVD or Blu-ray, or upload the movie directly to Facebook, YouTube, Vimeo or Dailymotion. Top of the new features list this time has to be the support for multicam editing, which helps you mix footage from up to four sources into a single video sequence. PowerDirector’s version of this initially seems a little odd it forces you to work in an entirely different dialog, not the main project timeline but once you’ve learned the basics then it generally works very well. Clicking Plugins >> MultiCam Designer opens a four pane window, where you can add your source clips (although only from the Media Room or your hard drive, not the timeline). As usual with multicam editing you must then synchronize your clips, and PowerDirector supports all the options you’d expect. Choose "Audio Analysis" and the program will sync the clips itself (and generally very successfully, in our first tests); it can also use video timecodes, or file creation times; or you can manually add markers representing the same time point in each clip. Once you’re happy, click Record and the source clips play simultaneously and very smoothly (no stuttering), one in each pane. Switching angle is then as easy as pressing a key (1-4), or clicking a pane. If you’re a few frames out then you can tweak your timing later to get it exactly right. And this applies even after you’ve clicked OK and your recording has transferred to the main timeline; you can always reopen the sequence in the MultiCam Designer and adjust it to suit your needs. The end result is a good mid-range editing tool, a significant improvement on MAGIX Movie Edit Pro (supports more cams, better performance and syncing) though not as natural as Final Edit Pro. Still, for the most part the MultiCam Designer works very well; there’s plenty of power here, yet it’s still quite simple to operate. The second major addition to PowerDirector 12 is the Theme Designer, which helps you convert your movies and images into a custom 3D animated slideshow. If you think this sounds a lot like PowerDirector’s Slideshow Creator then you’d be right, but the new tool does have a little more to offer. At a minimum, you might use the Theme Designer just for its animated 3D templates, which variously place your images in film strips, postcards and picture frames, see them swooping over fields, and more. Once you’ve chosen a template, your photos can be added with a click, previewed, then exported to your project timeline. The real plus point here, though, is the control you get over the finished results. You can customize the template sequence, perhaps adding a new intro, moving some shots around, deleting others entirely. There are options to add your preferred effects, transitions or backgrounds. And although the standard background music is generally annoying, and often too short, you can always add your own. While this sounds great, in theory, we were less convinced after trying it out. The interface is cluttered, less than intuitive, with a poor layout, and the templates aren’t always the best, either. The customization options are good, but otherwise the Theme Designer might benefit from a minor redesign itself. 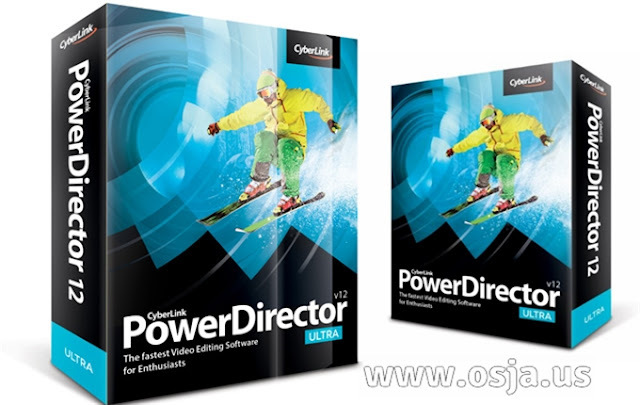 You can never have enough video effects, and so it’s good to see PowerDirector 12 add even more to its already extensive range. So Tilt/ Shift allows you to shift your focus to a particular area of the screen; Water Reflection adds a rippling lake to your shot, reflecting everything else in the frame; Magnifier is a circular magnifying glass-type effect which zooms in on whatever lies behind it; Lens Flare simulates a configurable sun-like flare to your shot, and Time Stamp adds a digital clock showing the scene’s duration. Additionally, picture-in-picture and text objects can now be given a motion blur effect, with a custom blur length and density. It takes a little experimenting to find where this works, and where it really doesn’t, but we found the effect did give a smooth and more realistic motion to many of our animated captions. And elsewhere, PowerDirector 12 Ultimate and Ultimate Suite gain two NewBlue Essentials packs, with 20 extra effects in total: Auto Contrast, Chroma Key, Color EQ, Color Swap, Diffusion, Dual Booster, Edge Smoother, Gradient Tint, Image Mapper, Lens Correction, Letterbox, Noise Reduction, Picture-In-Picture, Proportion Helper, Rack Focus, Rolling Shutter, Shadows and Highlights, Split Screen, Spotlight and Vignette. While this seems like a lengthy list, you probably won’t be reaching for most of these very often. Tilt/ Shift works well, but requires some knowledge and work to set up; Water Reflection isn’t exactly subtle, and the NewBlue effects vary considerably in their usefulness. Still, the Lens Flare and Magnifier effects deliver good results, they’re all very configurable, and on balance they get a qualified thumbs up from us. Better format and standards support sees the program able to import animated GIFs, movies with Dolby Digital Plus 5.1 channel audio, and PowerPoint files (although the latter needs PowerPoint to be installed on your PC). These may be enhanced with two new content packs, Holiday Pack 4 and Content Pack Premium, and there are some new transition effects on hand if you need them. PowerDirector’s Content-Aware Editing scans long movies to identify the important shots (anything with faces, motion, where you’re panning or zooming in), as well as automatically fixing lighting issues and stabilizing shaky footage. This generally works well, and a new ability to detect speech means it could now be even more accurate. There are other additions, too -- in particular, an improved chroma key now delivers noticeably better results -- but the real benefit here is in performance. CyberLink says their new TrueVelocity 4 engine is at least 40 percent faster at H.264 encoding, up to 300 percent faster on Haswell systems, impressive for what was already a speedy product. And this isn’t just about encoding, either: PowerDirector 12 is almost always speedy and responsive, quickly applying edits, and playing even high resolution previews smoothly and without stuttering. Requirements: Minimum 1024x768 resolution, 3GB RAM for 32-bit OS/ 6GB RAM for 64-bit OS, 10 GB free hard drive space (20 GB recommended) for DVD production, 60 GB (100 GB recommended) for Blu-ray Disc/AVCHD production.